It is on the banks of the Omo River in Ethiopia, close to the Kenyan border, that many tribes are facing a major water crisis that threatens their everyday lives. Climate change and the construction of a major dam (Gibe III) have caused many drought problems in the river which, besides these problems, is also contaminated by human waste. Every day, women and children have to walk several kilometers to find a water hole or to dig in the ground to fetch water for their families. This crisis is the source of many conflict between rival tribes, with men fighting each other and getting killed for a place where they can find a clean water point or grassed land. 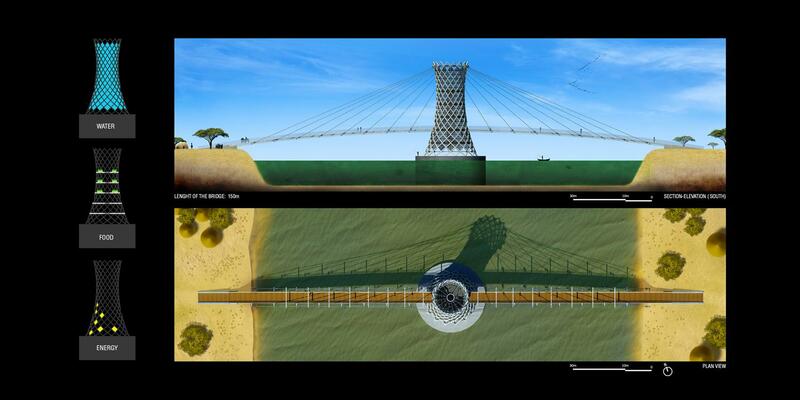 Furthermore, the region is in need of bridges that can potentially activate and increase the economy of the villagers in the area as well as facilitate the flow of humans and their herd of cows and sheep looking for pasture, by connecting one side of the Omo River to the other. In the context of the Omorate village, which borders the Omo River in Ethiopia, our natural response was to design a bridge that can do more than just connecting the two sides. 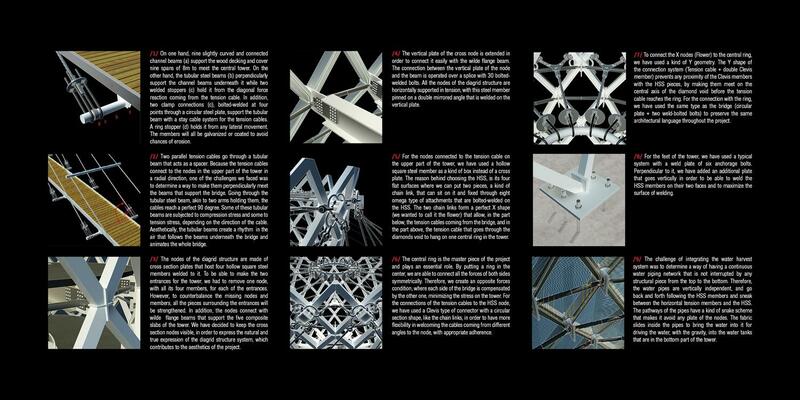 The Warka Waterís harvest system is a structure for a special fabric that liquefies the water vapour or humidity that comes from the oceans and this water is then collected to be used subsequently. Because of its gaseous state, the collected water is completely clean and therefore safely drinkable. 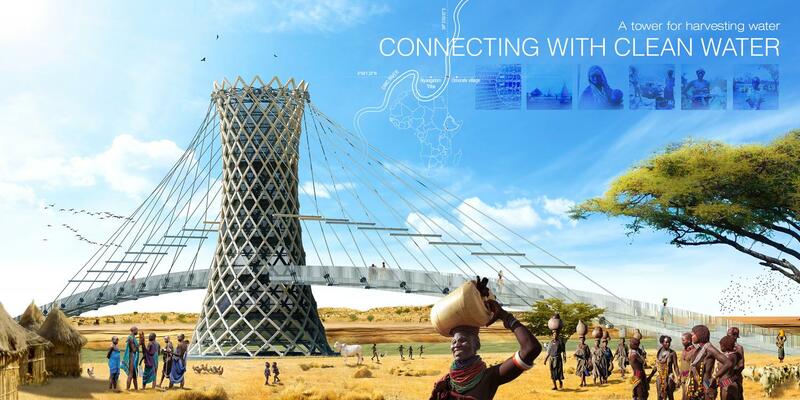 Inspired from the Warka technic, our strategy is to create a central diagrid tower that will not only hold the bridge through a tension cable system, but will harvest water and integrate a program of five storeys for farming and collecting the water stored in the water tanks. 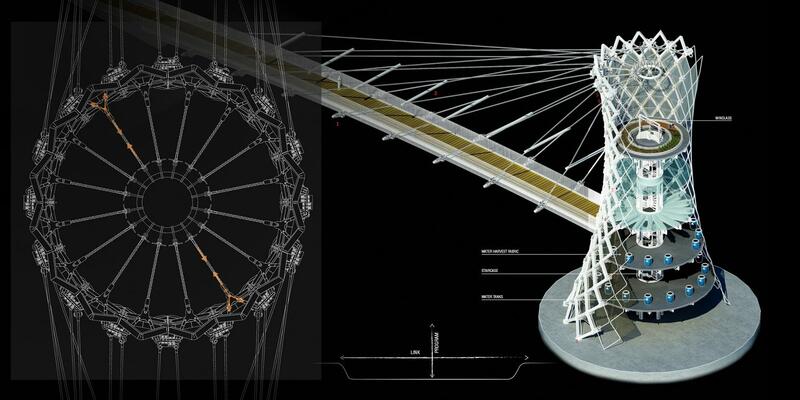 The diagrid steel structure system is a perfect fit for supporting the water harvesting fabric because of its framing system, where the steel members bear a water piping network that collects the water coming from the fabrics on the diamonds voids. 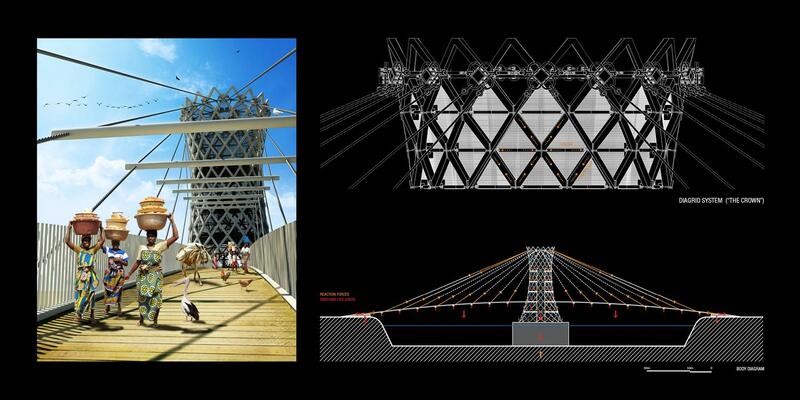 Moreover, we have decided to incorporate a few photovoltaic panels in some of the diamonds voids in the south part of the tower in order to collect some energy for lighting and other facilities, like operating water pumps. 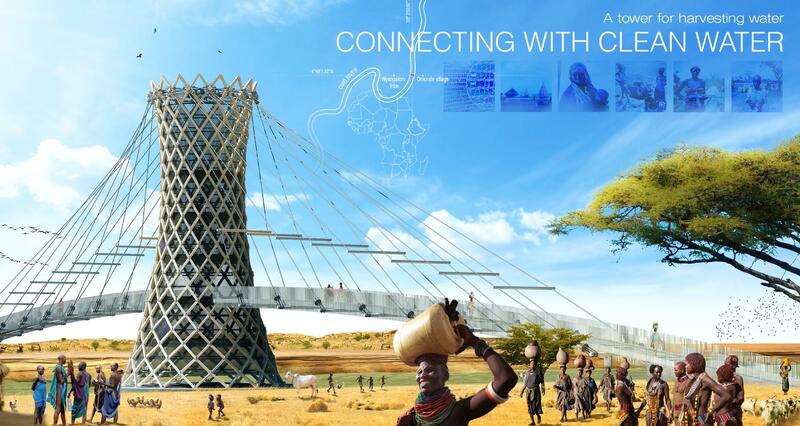 In conclusion, our proposal is to build a bridge with a tower that can harvest water; a tower that can connect people; a tower that can provide fresh food; a tower that can create energy; a tower of life; and finally, a tower that will connect both sides of the threatened river while also connecting people with clean water, at the same time.